THOMAS JEFFERSON. Document Signed as Secretary of State. 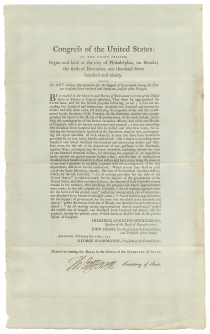 An Act making appropriations for the support of government during the year one thousand seven hundred and ninety one, and for other purposes, February 11, 1791. [Philadelphia: Childs and Swaine, 1791]. Signed in type by George Washington as President, Frederick Augustus Muhlenberg as Speaker of the House of Representatives, and John Adams as Vice President and President of the Senate. 2 pp., 9¼ x 15 in. Variant of Evans 23860. Jefferson signed two copies of each Act for distribution to the executive of every state. Rhode Island had ratified the Constitution and become the 13th state in May of 1790. 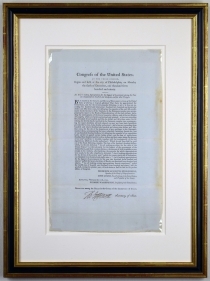 Thus, Jefferson signed 26 copies of this Act. Few copies of any of the Acts Jefferson signed survive.